Events like the FIFA World Cup 2002, cohosted by South Korea and Japan, the Japanese prime minister Koizumi’s visit to Pyongyang in September 2002, and recent controversies surrounding the North Korean nuclear program have once again brought relations between Japan and the Korean peninsula to the world’s attention. In spite of continuing controversies about diverging interpretations of modern history, the cohosting of the soccer World Cup has demonstrated tendencies of rapprochement and cooperation between the neighbors. 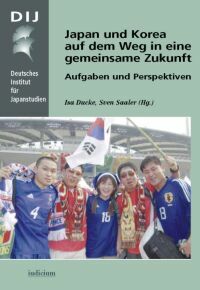 This volume combines articles by Korean, Japanese, and German experts, each discussing the recent developments in Japan’s relations with its neighbors. It is based on papers given at an international conference organized in September 2002 in Brühl and Cologne (Germany) by the DIJ, The Japan Cultural Institute in Cologne, and the German Federal Agency for Civic Education (Bundeszentrale für politische Bildung). Führt eine Zukunftsorientierung wirklich in eine gemeinsame Zukunft? Gibt das Jahr 2002 den Beziehungen zwischen Japan und Südkorea eine neue Richtung?